When Cataclysm came out, I made sure to hit up every zone. Tumunzahar went through Vashj’ir and even as a Holy Priest it was enjoyable. I quite liked the quests and the lore of the zone. Granted, it took much longer to do anything until you got your swimming boost, but it wasn’t all bad. At least not as bad as everyone made it seem to be. At least not the first time. I’ve taken several toons through the Cataclysm content since then and always went to Hyjal simply because of how quick and easy the zone is. It’s more familiarity than anything else. So when the Death Knight recently hit 80 I decided to shake things up a bit and head back under the sea. What a terrible idea that was. Now, as you might expect, there wasn’t another soul in sight. I’m used to that at lower levels, so no biggie. Got my quests and off I went swimming. And swimming. And swimming. It was painful. So much so that I managed to hand in one quest (despite being in the process of completing several more) and then hearthed back to Orgrimmar. Because damn. It then reminded me of what I mentioned earlier, and that’s that most people hate the zone and avoid it like the plague. It got me thinking about all the zones in the game now, and there are plenty of them. Is there any other one that comes even close to Vashj’ir in terms of disdain? I mean, for me Hellfire Penninsula was revolting because of all the damn boars everywhere and the grief that caused me over time. But that’s peanuts compared to trying to go through Sea World. I know some might mention Lost Isles but even that’s limited to Goblins only. The thing with Vashj’ir is that in principle it was a fantastic idea. I think what separates it from everything else is the 3D movement and combat. It’s one thing to do it in the air, such as we are used to courtesy of the Oculus and other such events. But in the water folks can get confused. And really, we were in the water for a lot longer than a few minutes in a raid. Not to mention, you were hardly ever on the ground. Interacting with mobs and NPC’s was tricky as a result…and they weren’t always easy to find because the zone was huge in terms of both depth and sprawling. It’s too bad, because lore wise it’s definitely one of the best zones in the game…even if some of the stories were left unfinished. It leads me to hope we get some sort of follow up down the road. And I think Blizzard could learn a lot from the zone and make a lot of great improvements that would lead to people enjoying the environment more. In the mean time I think Vashj’ir will continue to be the zone that is the most devoid of players. Love is in the air across Azeroth, and it’s honestly one of my least favourite seasonal event. As much of a romantic as I am, it just doesn’t do anything for me. Plus, there’s no reward of substance though I know folks love the rocket. Peddlefeet is a dime a dozen. You don’t even need to try and get him. Just go to the auction house over the next two weeks and pick one up for cheap. Ok, so the lamenting of the event really doesn’t go with the title of the post. 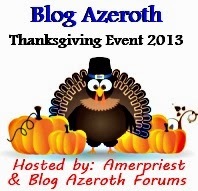 But, with this event, it got me thinking to what it was about World of Warcraft that I love. Why is it there are dozens of MMO’s that aren’t far off, some even do it better than Blizzard, and yet no matter what I play it never feels like WoW? Admittedly there was a time where the short answer was the people. Back when Claws of Nature was booming, and my blogroll was always active, things were good. It felt like something more than just a game. But now I’m almost completely devoid of that. There are less than a dozen fellow bloggers I talk to at any given time. The only Claws I talk to anymore are my wife and my son’s Godfather. Heck, I don’t even talk to anyone on my current server. I’d like for my wife and son to both play with me, and that might happen at some point, but still I play without them. So again I ask, what is it? It’s something I do for other people quite often but rarely have done for me: create a rich story and environment. As a dungeon master I take great pride in putting together fun adventures, characters, and stories for my players. But I’m always the DM. Bridesmaid, but never the bride anymore. Alas, I’m sidetracking. It isn’t because I don’t get to be a player that I play WoW. It’s because I get to jump in and connect with all of it. All the stories. From the Van Cleefs and lazy peons, to Arthas and that idiot druid Zen’kiki. I find it all fantastic. I’m familiar with it, knowing a great deal inside and out. I enjoy considering myself a part of that. Lore wise my character specifically has nothing to do with the plot (despite the game alluding to it otherwise). I’m a background pebble in the middle of a rockslide. But man is it a fun ride. No other game comes close to pulling you in. Not as quickly as WoW is capable of doing. The quest system often does a great job of setting the narrative of what’s going on and there’s enough flavourful characters out and about to just make some situations that much better…to say nothing of cut scenes (which at points are almost overdone). I loved playing Guild Wars, but I never felt connected to it. Some events, absolutely. But as a whole, I still felt something lacking. DC Online? Same. And I love me some DC Universe. The one thing Blizzard does as well as anyone, if not better, is tell their stories. For me, that’s the fish hook. Fortunately there’s a fresh batch on the way between the above shown Chronicles, Battle for Azeroth, and the novel that leads into it. And indeed, I love it. I honestly didn’t just toss up a few posts and leave. Truth be told WordPress was griefing me something fierce. I couldn’t login because my username wasn’t recognized. Then it was my password. Efforts to have that reset didn’t go well at all. Fortunately I came to the discovery that my work computer was still logged in and not too long ago I got everything sorted out. In the meantime, I’ve just been too darn busy to devote some time to this post. A lot has happened since my last post and those currently subscribed are no doubt experiencing all of the goodies (and apparently some bad?) that came with the final patch of Legion. 7.3.5 brought about the new leveling system and a myriad of other changes. Meanwhile, I’m still chilling in my private lands. I honestly didn’t touch the game for the past month and the nice thing is in doing so I felt no guilt. Normally I’d make the effort simply based on the idea that I’m paying for it. Now I can take a break from gameplay and not fret. I can also come back to it fresh as a daisy as I did this week. The Druid finished up Outland, while the Hunter is still there. Death Knight’s just heading into Cataclysm territory, while the Paladin and Demon Hunter lead their respective factions as both are capped. I’m hoping to get an introduction post, but thus far most of them are camera shy (which means I’m having quite the time trying to get them transmogged). I can’t blame the Hunter. He’s level 62 and wearing level 1 gloves. Talk about your bad luck drops. But hopefully my bad luck with WordPress has come to a close and I can actually contribute thought to this page once more. Goodness knows I miss doing so, and I certainly enjoy it. Even when not playing I’m tied to Azeroth and this helps me enjoy it even further. You Want To Bring War? Then Bring World War! We know the line is being drawn once more between the Horde and Alliance. After a couple of expansions of working together (brought on by bat-crazy Garrosh), it’s going to go out the window all over again. But that’s the heart of Azeroth (no, not the necklace) over two decades. Two sides that just can’t exist together for one reason or many others. The Battle For Azeroth focuses on one specific area. The stretch of sea between Zandalar and Kul’Tiras. We start on our own island and once reaching the level cap we will be able to start venturing on the other side. Not to mention the 3-player expeditions to islands between them. Then there are Warfronts as well. But as far as we know, that’s it. The Battle For Azeroth shouldn’t happen over just a tenth of the (known) world. It should be all encompassing in more than just (likely) scenarios for high level characters. The effects should be felt everywhere. This actually ties in with something I have felt for a long time, in that the events and quests that take place throughout Kalimdor and the Eastern Kingdoms need to evolve and change. I had this idea that every month or so, one of the region’s could get tweaked. Maybe the Gnolls are no longer encroaching on Redridge. Or the Trolls of Zul’Aman come further out into the Ghostlands. Those kind of things. Perhaps a quest-giver is gone or has moved somewhere else and has new ambitions. Regardless of how it played out, it feels necessary. It would make the game feel more alive and we haven’t had any real change since Cataclysm seven years ago. Much of the change that came then was well done in principal, but the execution left a lot to be desired. Still, the world was changed. So why can’t it change again? We don’t need land masses drastically altered like things were when Deathwing arrived. But something would be nice, and this is the perfect time to do it in a story sense. So much comes from war and conflict and when you’re talking about a battle for a planet then it should involve the whole planet. Accidental casualties, espionage, gathering supplies, constructing machines of war. All of these things could be spread out throughout places across the land. Not every place, mind you. After all, what’s Loch Modan going to contribute in the grand scheme of things? But a few zones (aside from what looks like Undercity and Teldrassil) would be nice all the same. I want to feel like it really is global conflict rather than just a few islands in a fresh expansion. 0:07 is Lordaeron. Apparently not everyone noticed. 0:30 Sylvanas concludes a nice assessment. The Horde and Alliance have worked together but every time the unity is broken. 0:40 Yup. The Alliance is at the front door and not politely knocking. What lead to this? 0:43 Anduin has Shalamayne. But it seems to have an aura more akin to the Light. 0:47 As expected, Genn is the military leader and Anduin’s right hand. 0:50 That helm would look badass and frightening on anyone other than Anduin. 1:05 Most of the dwarven gunners are clearly Engineers. Note the goggles. 1:17 The Tauren almost looks to be dragging a green Garrosh. Obviously it’s not. 1:27 The orc struck with the arrows almost seems to be a nod to the Burning Crusade trailer when the orc in that is revived by a Blood Elf priest. 1:43 Sylvanas’ realization that they’re losing the fight, and subsequent decision is a defining moment. She also really looks human in this moment. 1:47 Just in case there was any doubt how strong she is. 1:56 For the first time in WoW we see Sylvanas use her banshee form, and damn was it awesome. 2:07 That “For The Horde” cry rallied me to their side, let alone her army. That might be the single greatest moment in any of the cinematics. 2:20 Love the Tauren using his horns to attack. Still surprised we don’t have that as an ability in game. 2:30 A few Draenei on the front lines now means the only two races we haven’t seen are Gnomes and Blood Elves. 2:34 Anduin is getting better as a fighter, but he’s not there yet. 2:55 Seems he even has some of dad’s temper. 3:00 No, that’s not the same Troll. The shaman didn’t have a shield. 3:22 He can wield the light and then some. Mists of Pandaria did a great job starting that story. I really do see him as a Paladin by the end of this next expansion. Succeeding where Arthas failed? 3:24 Sylvanas almost had a look that was mildly impressed. 3:54 Anduin comes off a bit more like dad. The rallying cry was good, but still not as impressive as Sylvanas’. 3:57 Yep, Sylvanas is definitely amused. 0:03 Under the tranquility of a Moonwell Jaina references her father. Once upon a time the two were on opposite sides of peace and treatment of others (specifically the orcs). 0:18 Teldrassil is on fire. Not just a little bit either. What in the Maelstrom lead to that happening? Odds are this is what leads the Alliance to Lordaeron. 0:25 “We’ve made kindling from our suffering.” Similar to the assessment of Sylvanas in the cinematic but much more blunt and painful. 0:31 “Waiting for a single spark.” Well, the burning tree does a pretty good job of that. Clearly that story will be the main catalyst for the expansion’s activities. 0:38 The Alliance gets Kul Tiras. The port looks gorgeous. It feels so much more alive than Stormwind for example. 0:43 Our first “new beast” sighting. Looks like some sort of foliage demon. Head also reminds me of the Power Generator Hood. 0:46 That pile of gold…you know he’s a Dungeon Boss for certain. 0:52 What are those? Trolls? 0:55 Quest boss or Dungeon boss? Either way, she reminds me of the witch with Snow White’s apple. Just torturing a player instead. 0:57 “I. AM. GROOT.” Don’t laugh, even my 7 year old thought it. 1:03 This was our first confirmation of separate leveling zones. 1:15 I feel like people are going to be screaming for a Brontomount. 1:24 Snake people. Makes sense. We’re running low on options for humanoid animals. Personally, fear the idea of Skunkfolk. 1:26 Oooh, Old God style tendrils. Including some with an eyeball. I like it. 1:29 I said it during the last two expansions…thank heavens Blizzard did away with the five level expansions. 1:31 I have always loved the aesthetics of the Troll Dungeons. 1:34 The mantid and qiraji were cross-bred by the trolls? 1:37 This reminds me a lot of Howling Fjorde and Grizzly Hills. Nothing wrong with that. 1:38 More pirates. Same dungeon as before maybe? It would be great if it recaptured the feel of classic Deadmines. Well, aside from not actually being in a mine. 1:41 These are the 3-player island scenarios that were talked about. I’m really intrigued by the potential of them. 1:46 Wrath players remember the Wyrms. Making them undead terrifies me. 1:49 Warfronts. Apparently Warcraft 3 in nature. Not my cup of tea but folks will be happy. 1:56 It’s Jaina! Oh damn. She looks like all she’s done since she left Dalaran is hit the bottle. 2:08 Final emphasis on the theme of the expansion. 2:15 And we end with the reveal of the expansion’s name. I always enjoy the reveal trailers. They tend to preview a great deal and then once we’re in the content it’s fun to remember those details when we first saw them. Of course, we also see things that don’t always make the final cut. It will be interesting to see all of these things when the time comes. The two trailers together did a fantastic job of setting the stage for Battle For Azeroth. I still wonder most about the connection between Teldrassil and Undercity. I mean, there’s an obvious explanation for it, but I would rather see it confirmed and played out rather than cast suspicions. Plus doing so still wouldn’t get to the heart of what she does to trigger it. So that just happened. Well, a couple of hours ago now but I wanted to wait until the “What’s Next” panel concluded before I posted any thoughts. Let’s start with the trailer. I loved Anduin’s helm. If you didn’t know it was him, it would come across very cold. Too bad he’s the opposite. And then there’s his opposite on the battlefield. She can turn into a banshee again? I get goosebumps every time I watch the trailer and that moment comes up. That we got a cinematic trailer the same day Battle For Azeroth was announced was a great surprise by Blizzard. I think this one does a great job of setting up the expansion (so much for my “we don’t need factions anymore”). One has to wonder how she obtained the ability to transform and also what brought the Alliance to the doorstep of Lordaeron. Hopefully enough will be explained at some point before we head off to Zandalar and Kul’Tiras. Given the theme of the expansion, I really enjoy the idea that the Horde and Alliance will go 110-120 in completely different regions. It puts a proper emphasis on the factions being strongly divided once more. Both zones look interesting enough from the previews we got but there wasn’t a whole lot of substance to that. I’m sure more will trickle out from the players who get to playtest it this weekend. Same goes for the two dungeons that were made available. Though I am very interested in the Kezan dungeon when the time comes. Who knows what the goblins have done this time? Going the Guild Wars 2 route with all zones of Azeroth. This seems long overdue to be able to have scaled questing anywhere on the planet. Glad they are finally not only bringing it forward but pairing up expansions as well (such as Outland and Northrend being scaled 60-80). I only hope that with it we can have a somewhat expedited xp boost. It still takes too long to level a character, even with heirlooms. New players get the instant boost, so they don’t have to do it if they don’t want to. But existing players are probably going to roll more alts. Why? Allied Races. We are getting half a dozen subraces, with three to each side. Horde receive the Highmountain, Nightborne, and Zandalari. On the Alliance side it’s the Dark Iron Dwaves, Light Forged Draenei, and Void Elves. These races each need to be recruited but once you do, you basically unlock them as an alt that starts at level 20. No Legendary Artifacts. Those are going to fall by the wayside and we’ll go back to standard weapons once more. Instead, we’ll have “The Heart of Azeroth” which is an amulet powered by Azerite (the very essence of Azeroth herself, seeping into the world). The more you get, the more you can do and it is used by three armor slots (helm is certain, my guess is chest and legs as well). Realms are going to be streamlined so that there are no longer PvP or PvE realms. Instead, you will have the option on any server to simply toggle PvP on or off. In doing it across all realms, this gives the developers a chance to do things like Bounty Hunter quests or assassinations. World of Warcraft Classic. You wonder where a guy is going when he talks about his two favourite ice creams being Cookies & Cream (yes) and Chocolate (meh)…until he mentions some people prefer Vanilla. It sounds like things are still in early stages, but the plan is in place to have throwback servers. Who knows how many, but they are definitely on the way at some point. There was more if you didn’t get to see the segment (or find it on YouTube yet), but I want to wait and see what comes from the panel later today as well as the Q & A before commenting further. 3:30 pm Eastern is the time we’re all waiting for. 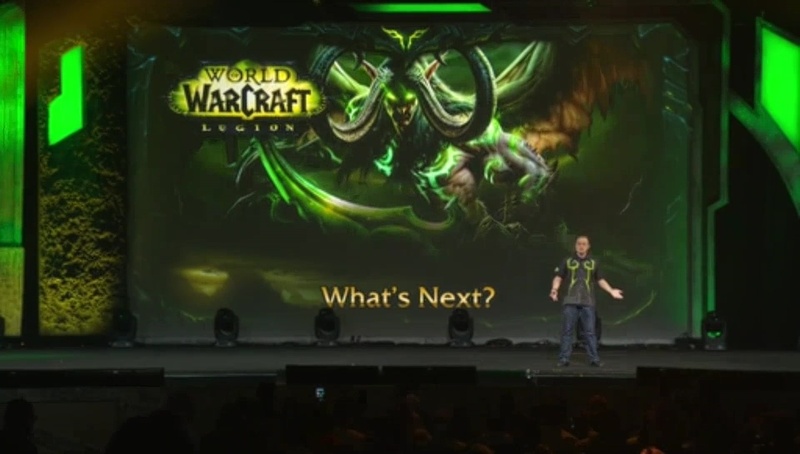 Well, there are other things of enjoyment but for most players it’s the “What’s Next” for WoW. In the Mythic Hall at that time is when we will find out the next expansion for the game. There are a lot of rumours and speculations about what the 7th(!) expansion will hold for the denizens of Azeroth. Ships? Kul Tiras? Naga? The Void? Old God? All of these things have been whispered for the last 3-6 months and we know some of it will be true. Some of it will be completely off the mark, but that’s ok too. The fun is in the speculation and there is even more excitement in the delivery. Personally I expect N’zoth and Jaina will be this expansion’s versions of Deathwing and Thrall (though hopefully not as obnoxious in the case of the latter). Enough rambling and excitement for now. The moment I get a link for the new trailer or cinematic, you can bet I will post it and share my further thoughts then.